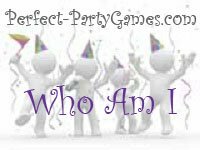 Before the guests arrive for this ice breaker party game, write down several items from a single category on the white labels. Ideas for categories could be: Vegetables, Famous Actors/Actresses, Historical Figures that have died, Famous Writers, Automobiles, Popular Songs, Movie Titles, Walt Disney Characters or just Disney Princesses. As the guests arrive, put one sticker on their back without them knowing what specific item it is but telling all guests the category. Everyone must ask only "yes" or "no" questions about the word/item on their back. When the person has guessed what or who they are, they can remove the sticker from the back and place it in front. To make sure your guests are mingling more, let them only ask three questions to any one person in the room. The first player to guess who or what they are, wins. Variation: At Christmas time, use characters from the Bible.